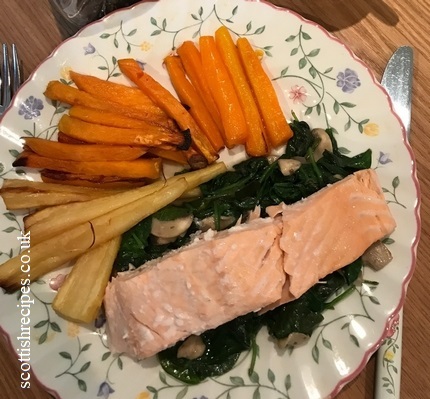 We threw this salmon recipe together on a hot summer in Scotland when we wanted a healthy meal full of vegetables without too much cooking. Peel and slice the sweet potato, parsnips and carrots. Place the vegetables in a shallow oven pan and toss in a small amount of olive oil. Roast for 40 - 45 minutes turning half way through. Place the salmon in foil and sprinkle with lemon juice. Wrap the fish in the foil and place in the oven for 20 minutes. Slice mushrooms and fry in a hot pan. Add lemon juice. Add the spinach, small handfuls at a time and stir for 4 minutes. See also the Salmon and tattie broth recipe.